When it’s time to replace your aging deck, you know … you just know. That’s when you call Archadeck of Austin to make it happen. We were called to replace an old, multi-level deck at this home in the Barton Hills area of Austin, TX, close to the Colorado River and not far from downtown Austin. 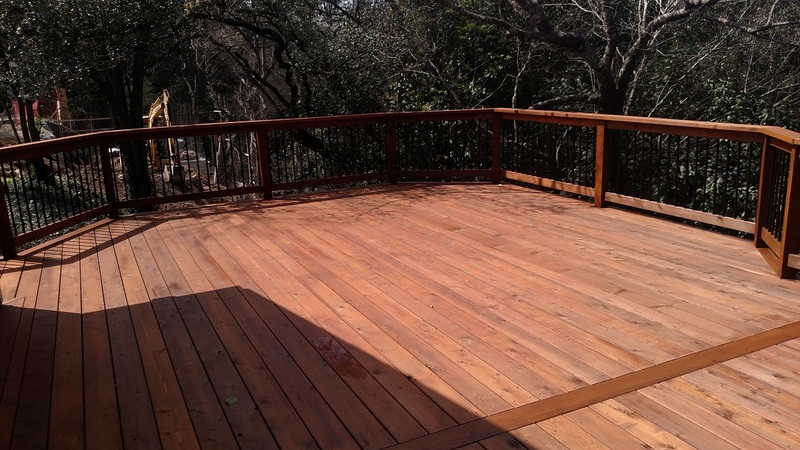 — New Archadeck of Austin custom cedar deck in Barton Hills. The existing deck was in bad shape because of damage that had occurred over time, which can happen anywhere. It happens to all wood decks eventually! In this case, trees were damaging the deck, which had been poorly built to begin with. — Deck before Archadeck of Austin began the project. If you know this terrain, you know how hilly it can be, and that’s what makes it so beautiful. This home is on a lot with a deep slope in the back, so the deck looks out over the trees and is practically perched up in the treetops. The slope of this lot definitely came into play during the project. The new deck we designed was going to be higher so we had to install oversized piers with 16” concrete footings. 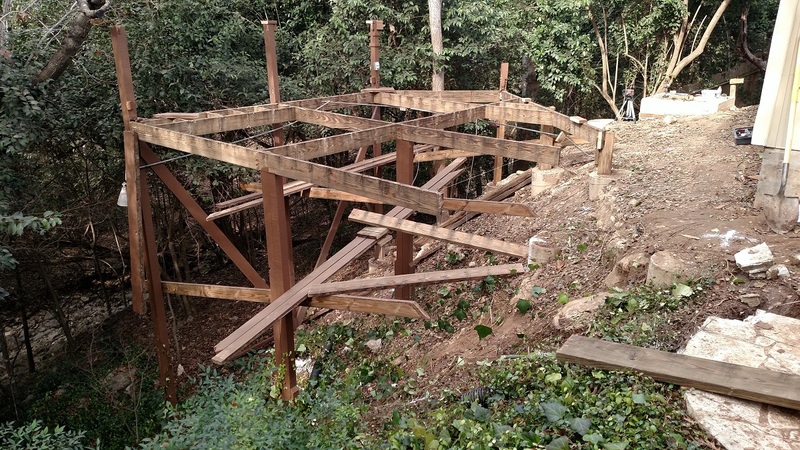 When we demolished the old deck, we left some of the supporting structure up to use for scaffolding — a wise decision! The Beauty of Wood Wins Again! 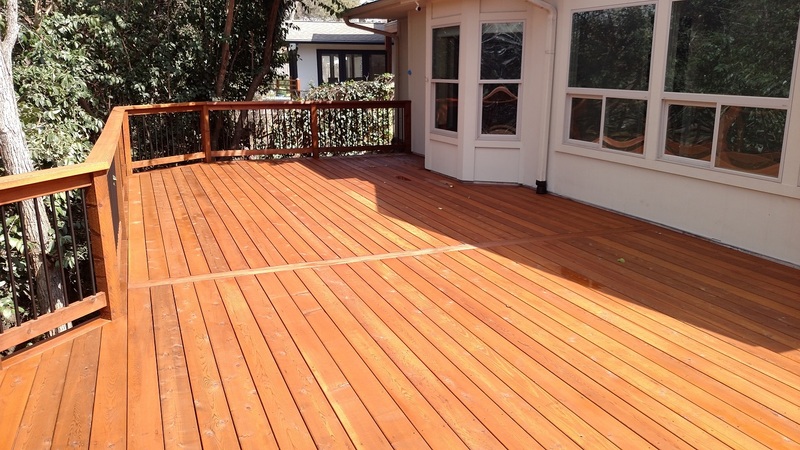 For their decking material, the homeowners chose natural cedar, a beautiful wood for decks. We designed the deck surface using continuous 20-foot lengths. For a neat and tidy appearance, we used ribbon boards to hide end-to-end seams where possible. Austin deck builder Archadeck of Austin stains all cedar decks so they start out looking their absolute best. You can see the beauty of the wood in these photos. Likewise, when we work with hardwoods we oil the wood. Homeowners will need to follow up with routine maintenance every year or two, but we take these extra steps to get them started on the right track. Our competitors do not provide this level of care and service. 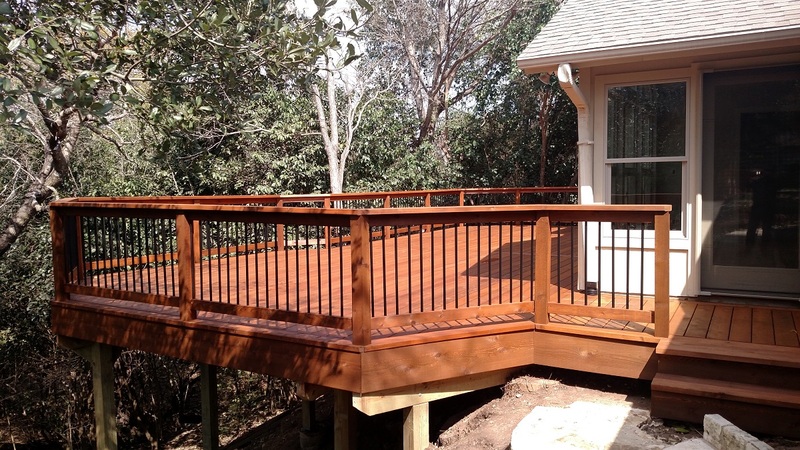 For their deck railing system, the homeowners chose aluminum balusters or pickets in the black sand color and a cedar 2″×6″ cap over the railing. Against the backdrop of the trees, these black balusters seem to disappear when you look through them, and they don’t block the view the way the old wooden balusters did. These homeowners are already enjoying their sleek, new deck in the treetops. Like them, once you replace that aging deck you’ll wonder why you didn’t make the call sooner. Do you have an older deck or patio that has seen better days? 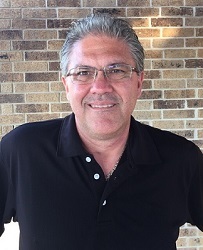 To talk about replacing any part of your outdoor living space, call Archadeck of Austin today at 512-259-8282 or email us to schedule your free design consultation.